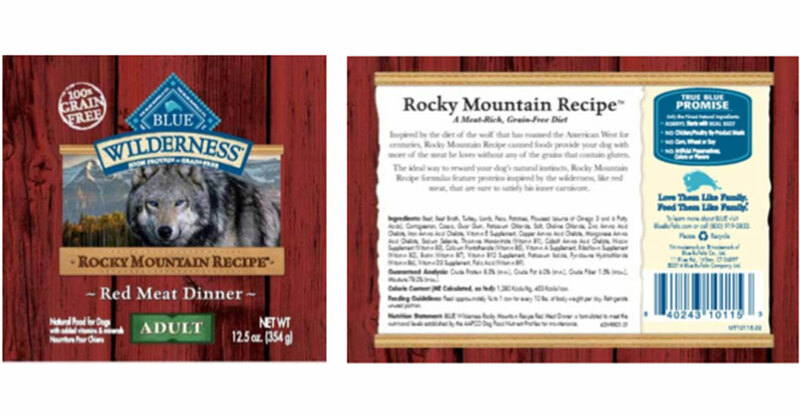 BREAKING NEWS: Blue Buffalo has announced a voluntary recall of one lot of BLUE Wilderness Rocky Mountain Recipe Red Meat Dinner Wet Food for Adult Dogs due to possible elevated levels of beef thyroid hormones. Elevated levels may affect a dog’s metabolism and can be associated with increased thirst, increased urinary output, restless behavior and weight loss. These symptoms may resolve when the use of the impacted food is discontinued. However, with prolonged consumption these symptoms may increase in severity and may include vomiting, diarrhea, and rapid or difficulty breathing. This product is being voluntarily recalled as a precautionary measure due to elevated levels of beef thyroid hormone. Although the Blue Buffalo Customer Care Resource Team has not received any reports of dogs exhibiting these symptoms from consuming this product, the FDA advised Blue Buffalo of a single consumer who reported symptoms in one dog. Blue Buffalo immediately began an investigation. After working with the FDA, Blue Buffalo decided it would be prudent to recall the one production lot in question. The one dog was also being fed non-Blue Buffalo food and has fully-recovered. If you have this product in your possession, discontinue use immediately, and return the food for a full refund. You can contact Blue Buffalo at 1-866-201-9072 from 8 a.m. to 5 p.m. EST Monday through Friday, or by email at CustomerCare@bluebuffalo.com for more information., or contact your nearest FDA consumer complaint coordinator with any questions. This Blue Buffalo recall is just one of over 38 recalls that have occurred in the past year. Your pets deserve better.